2013 KTM Freeride E. Picture credits - KTM. Submit more pictures. It�s time for a new offroad motorcycle segment! It�s time for more motorcycle freedom! It�s time for the Freeride E! With the revolutionary Freeride E, KTM takes lightweight, noise-free and agile offroad motorcycles where enduro riding was previously impossible: into the city! With 42 Nm of torque, up to 22 kW (30 hp) peak power and uninterrupted acceleration, it�s just as sporty as other KTM bikes. Only it needs recharging rather than refuelling. Frame type: Perimeter steel-aluminium composite frame. Subframe: High-strength polymide / ABS plastic. Rear brakes: Single disc. Two-piston calipers. Radially mounted. Ask questions Join the 13 KTM Freeride E discussion group or the general KTM discussion group. Rate motorcycles you know and help your fellow riders to find the bike that is right for them. Bikez has the most users and the most extensive motorcycle rating on the net. It includes reliability, design, engine performance, accident risk, repair cost, offroad capabilities, racing track capabilities and touring capabilities. The ratings are also used to rank the 100 most popular MC models each year since 1990. The lists	are adjusted weekly as new ratings are added. 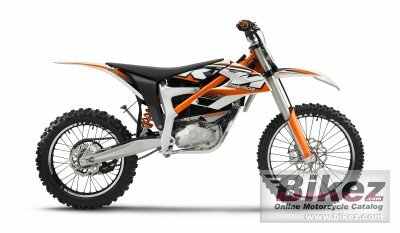 You can check out the rating of the 2013 KTM Freeride E and compare it to other bikes here.